It's February in Chicago and winter feels like it's never ending. You are probably cursing that groundhog, questioning why you live here, dreaming of getting on a plane and going somewhere warm or maybe all of the above. I usually try to calculate through the entire month of February if I can just get in the car and drive until I get to the ocean or at least warm weather. However usually one of us (or all of us) are hit with some sickness and getting away for a long weekend doesn't work out. So we have to find a way to survive the winter and try to keep our sanity. I still haven't figured out a way to keep healthy all winter--please send tips and juice! We are blessed in Chicago area that there is so much to do every season so before you book your tickets and fly away for the rest of winter (take me with you!) here's some ideas to make winter enjoyable until Spring is here to stay. If I have a little more time I head to Garfield Park Conservatory. I could go on and on all day about these two wonderful places, how much I love them and the wonderful events and experiences we have had there however they really need entire posts dedicated to each of them. I will publish those in the next couple months and update this post when I do. In the meantime here's just a few of the probably thousands of photos I have at each of them and extremely quick details on each. There are 3 main rooms at Oak Park Conservatory. This front room changes with the seasons. The largest room is a tropical fern room and the other is a desert room. There is now also an outdoor play area check it out when the weather is good. There are so many flowers and plants to discover at Oak Park Conservatory. Be sure to stop at the desk and ask for the little explorer bags at Oak Park Conservatory. They contain binoculars, measuring tape, magnify glass and markers. Also pickup a clipboard with paper and a scavenger hunt sheet. 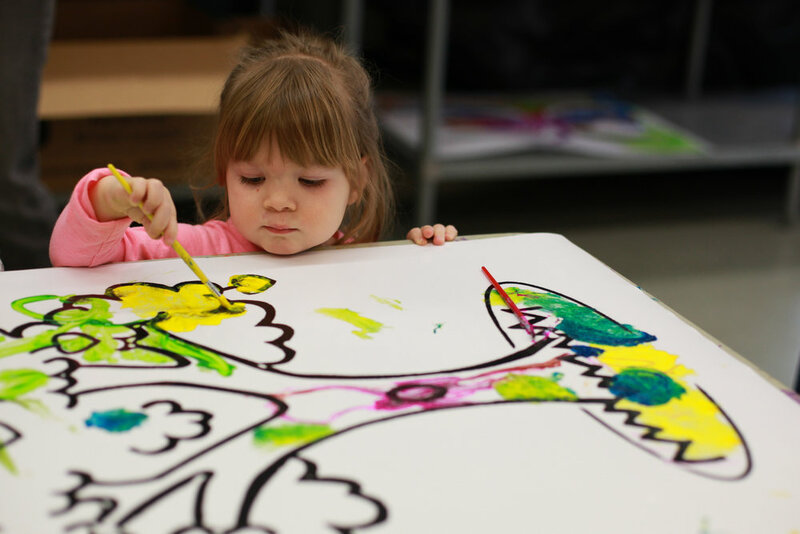 So much fun, learning and exploring for the littles--and adults too. Mark your calendars for March 4, 2018 for my favorite annual even in Oak Park, Kids Fest at Oak Park Conservatory celebrating George the parrot's birthday. There is usually some fun crafts, some special exhibit often live animals or insects, singing Happy Birthday to George and of course all the wonderful plants at the conservatory. I will hopefully share more before then but mark your calendars! Here's the group craft project from Kids Fest 2016. Sunshine shines during the 2018 Spring Flower Show at Garfield Park Conservatory. The show Hashtag: No Filter is in bloom until Mother's Day. Thanks Jon for take a mommy and daughter photo at Garfield Park Conservatory spring show 2017. It is great to be in front of the camera sometimes. "Go Cubs Go! Hey Chicago what do you say the CUBS (not Pirates Annabelle) are gonna win today!" Spring Show at Garfield Park Conservatory 2017. I can't wait to see the tulips bloom in this years show. I wonder what colors they will be this year. Sometimes Mickey gets to Adventure with us at Garfield Park Conservatory. I love the Desert room. The lighting is the best, temperature is usually just right and it's often really quiet in this part of the conservatory. Also look really close you might find a Mickey shaped cactus. Ok they call it Bunny Ears. It looks like it has fuzzy dots on it. But don't touch, if you look close those little dots contain a lot of little needles! There is so much to explore at Garfield Park Conservatory. Kids will love the Children's Garden. It even has a big tunnel slide, worth the climb. I often forget about Lincoln Park Conservatory because it's not as convenient for me to get to especially in winter. If you are in the Lincoln Park area you must check it out. Also in Lincoln Park check out Peggy Notebaert Nature Museum. It's a museum about nature but there is also a butterfly house and lots of windows to let in sunlight. Are there other local conservatories am I overlooking or are worth a drive? Grow something. Literally. Get your hands dirty and start your seeds. I am going to have to refer to my gardener friends on this one. So where are you raise those green thumbs high so I can see them. When can we start seeds? Soon right? I know it depends on what we are growing, but what if we haven't got a clue. What is a great set of seeds to start that you know people like me can't kill easily. Anyone have recommendations for a couple veggies, herbs and a few flowers. Every year I say I am going to get seeds started inside and it doesn't happen. Some years I buy the packs of seeds, the dirt and all the supplies--or collect egg cartons or other cute seed starters I found on Pinterest. Oh Pinterest I love and hate you. But then I stare at them clueless. One year (or two) I let Annabelle "plant" the seeds and they did well at first. But then when I moved them outside some critter ate them all. My money is on those squirrels who have destroyed so many things in our yard. Well my garden and farmer friends please help! She is seems so small here. This was Spring of 2015, hard to believe how fast 3 years has gone. I didn't get this photo until the roses were about a week after her birthday but they still looked great. You know this blog would be a lot better with another flower photo on it so maybe I should go get myself a bouquet from one of the local florist I drool over on Instagram. You know for "research purposes" or "for work." That excuse has totally worked before when I wanted pie from Spilt Milk. I had to get pumpkin pie to take a new photo for International Pumpkin Day. I needed something to post and of course I celebrate Pumpkin Day! I also HAD to get the pumpkin bread with maple glaze from Split Milk because it was International Pumpkin Day and it completed the photo. It was delicious. I know it's the end of winter and if you are like me the only you are feeling creative about is how you can make your comfy pants pass for real pants or see how many days you can go without leaving the house. It takes SO much energy to get those creative juices flowing in the winter time. It's especially hard when being creative is your job suddenly making anything that could resemble art feels like so much work. Looking at my notes for this helpful idea makes me laugh now. "1. 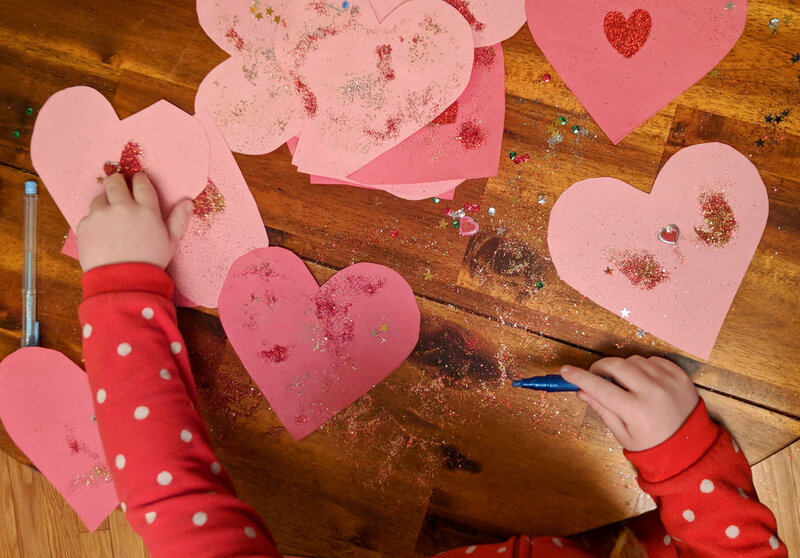 Make Crafts - Valentine's" HAHA no I am not some craft mom that does some cute pinterest worthy crafts with my daughter. My idea this year for her to make valentine's day cards was pretty old school and simple. Red and pink construction paper cut out hearts. Buy heart/love stickers, shimmery/glitter pins and glitter---I know I totally regret that last one. Sorry other parents in the class I am sure you cursed my name when your kid opened the envelope and glitter flew out. It wasn't like the cute Trolls shooting glitter everywhere either. It's probably still all over your house--trust me you haven't seen mine. My husband wasn't too happy either. But she sure had fun making them! This craft however did not help me survive winter it made it seem even longer. So depending on how much you value a little peace and quiet now vs extra clean-up later crafts (unless you are that crafty mom) might not be a good recommendation. Baking is messy work but fun. "2. Make Some Food" This is more laughable than the first one. Me making food is like the mom version of crafts with glitter. I am not the type of baker or chef to clean as I go. I actually really like cooking and making things. But the trail of flour, chopped vegetables or spices--because you have to give them that thrown dash into the pot/bowl--seriously it tastes better that way, all over the kitchen isn't really my idea of fun. I love my neighbor Emily she is always making the most amazing dishes AND she will surprise me and drop them off at my house. Seriously you guys I won the neighbor lottery--NEVER moving! (I can't cook but I help her out with coffee) I don't know how she does it. Seriously where do I even find xanthan gum for this amazing recipe that my daughter calls "the neighbor's cake"? Some day I will find the time to try it myself. Although I can already see my tiny kitchen covered in cinnamon crumb topping. So this suggestion is going so well isn't it? Well getting creative is a great way to get through the winter. Writing in a journal, making art, writing a hand written note/card or any other ways (seriously cooking and baking are wonderful) that you can create something it makes you feel a sense of joy and accomplishment. Is it Spring yet? This blog is longer than I thought it would be, maybe it's now spring. Nope still not yet. Fine. So there are some things that are good about winter. Soak up the snow --and I say this holding my breath hoping for no more snow this winter but it's only February and it's Chicago so not sure odds are in our favor. If it does snow again embrace it. It is beautiful. Get outside! Take some photos. Go sledding. Build a snowman. Make snow angels. Drink hot chocolate. She's dressed up in her fancy Cinderella dress, holding my hand, while we cuddle on the couch watching Moana. Take advantage of extra time indoors. Relax! It is totally okay in winter to cuddle up and watch a few extra movies. I hated being sick for the last couple weeks but it really forced me to slow down. Annabelle and I got in some extra cuddle time and watched Moana a few times. Moana is my favorite movie! Disney got everything right with that one. Singing the songs and seeing strong Moana makes you thing you can accomplish so much if you try and don't give up. A great movie to watch in the depths of winter! I also started tackling things I have been putting off, like hitting publish on blog posts. I also have been slowly going through my photo archive and getting it in order. It's a large and overwhelming task that makes winter seem way too short. There are many indoor places to explore too especially the wonderful museums, many of which are free in February. However I will save that for another day or it really will be spring before this is published. How do you survive winter in Chicago? Please send me your tips to staying healthy and finding joy when winter seems so long. In the meantime I will be complaining about that silly groundhog and dreaming of being back in Walt Disney World and I may or may not be doing so in my comfy pants.